Floating service station literally hurls huge drums of gasoline and oil over dikes to the isolated island asparagus farms in the deltas of the Sacramento and San Joaquin rivers of California. 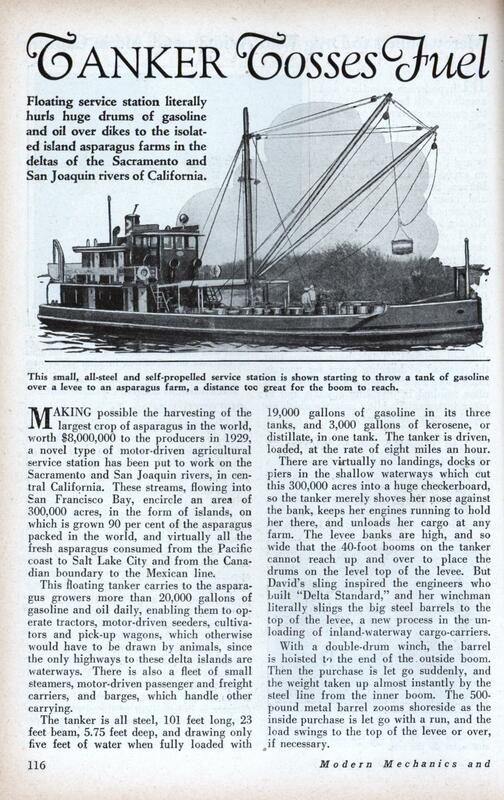 MAKING possible the harvesting of the largest crop of asparagus in the world, worth $8,000,000 to the producers in 1929, a novel type of motor-driven agricultural service station has been put to work on the Sacramento and San Joaquin rivers, in central California. These streams, flowing into San Francisco Bay, encircle an area of 300,000 acres, in the form of islands, on which is grown 90 per cent of the asparagus packed in the world, and virtually all the fresh asparagus consumed from the Pacific coast to Salt Lake City and from the Canadian boundary to the Mexican line. This floating tanker carries to the asparagus growers more than 20,000 gallons of gasoline and oil daily, enabling them to operate tractors, motor-driven seeders, cultivators and pick-up wagons, which otherwise would have to be drawn by animals, since the only highways to these delta islands are waterways. There is also a fleet of small steamers, motor-driven passenger and freight carriers, and barges, which handle other carrying. The tanker is all steel, 101 feet long, 23 feet beam, 5.75 feet deep, and drawing only five feet of water when fully loaded with 19,000 gallons of gasoline in its three tanks, and 3,000 gallons of kerosene, or distillate, in one tank. The tanker is driven, loaded, at the rate of eight miles an hour. There are virtually no landings, docks or piers in the shallow waterways which cut this 300,000 acres into a huge checkerboard, so the tanker merely shoves her nose against the bank, keeps her engines running to hold her there, and unloads her cargo at any farm. The levee banks are high, and so wide that the 40-foot booms on the tanker cannot reach up and over to place the drums on the level top of the levee. 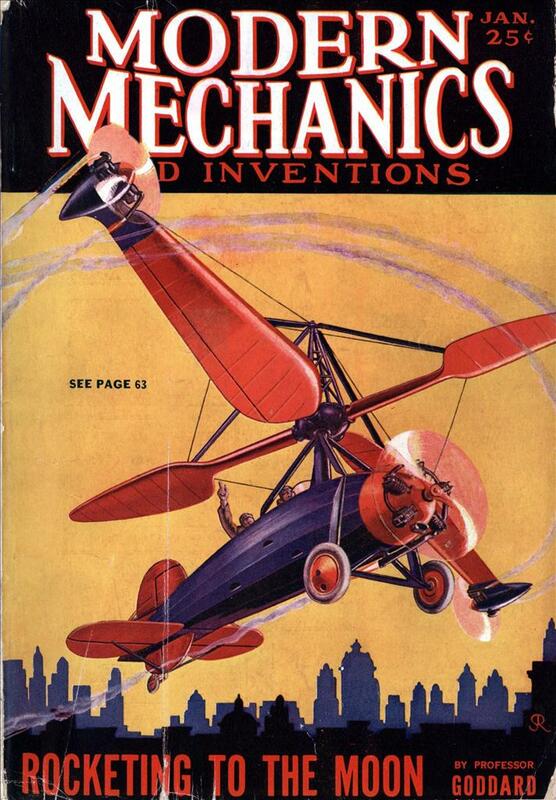 But David’s sling inspired the engineers who built “Delta Standard,” and her winchman literally slings the big steel barrels to the top of the levee, a new process in the unloading of inland-waterway cargo-carriers. With a double-drum winch, the barrel is hoisted to the end of the outside boom. Then the purchase is let go suddenly, and the weight taken up almost instantly by the steel line from the inner boom. The 500-pound metal barrel zooms shoreside as the inside purchase is let go with a run, and the load swings to the top of the levee or over, if necessary.